I once heard an old quote by Ernest Agyemang Yeboah that said: “Real silence is silence without words, silence that speaks words in silence and silence that talks better than words.” And so it was, on a beautiful spring day in Washington, D.C., Emma Gonzalez – the accidental activist and gun violence survivor of Stoneman Douglas High School in Parkland, Florida – stood silent, and the world seemed to hear her loud and clear. For what seemed like six painfully long minutes, as tears streamed down her face, we saw a girl of my age, also a senior in high school, teach a nation by her silence that sometimes, we are best left alone with our thoughts when there are no words that could do justice to a situation of such horror and magnitude. In those six precious minutes, 17 people had lost their lives. Emma wanted us to think about that. Think about the kids that won’t go home after six minutes. The parents who also didn’t return home from work because of those six minutes. The lives forever changed for those who survived, after just six minutes. I was not present for Emma’s speech in D.C. and would not see it until hours later when I returned home. Instead, I had risen early and once more took my fateful journey to New York City by rail to march with the masses of peers and anyone else who cared enough to make their voices heard. The Stoneman Douglas High School shooting was at the front of my mind on that cool morning. Just a few weeks earlier, 17 people – most of the high school kids and some as young as 14 – were slaughtered by the once-fellow student who re-entered their academic space with nothing but murder on his mind. He violently shot at defenseless students as they ran, screamed, and barricaded themselves in classrooms. Most would fail to outrun the bullets that ricocheted in the stairways and corridors. Most would never learn why they became the target of such hate. Many would not go home again. All would exit that high school building changed and scarred and traumatized … if they exited at all. Soon the children of Parkland who survived, most of whom will forever struggle with a form of post-traumatic stress disorder, turned their rage and helplessness into action – organizing rallies, speaking publicly of their pain and the “normal” lives their lost friends had before they were brutally taken away from them, and refusing to be intimidated by either gun lobbies or citizens who seem to cherish their Second Amendment right to own a firearm above any other right laid out by our Constitution, including the unalienable rights granted by the Declaration of Independence that are supposed to be protected by our government – that is the right to “life, liberty and the pursuit of happiness.” The 17 people who lost their lives that day, students, parents, coaches, teachers, children – however, each of them can be described – lost their right to live a long life on that day. As activism turned to action, we would learn names of Stoneman Douglas kids, kids similar to myself and my peers. These would soon become household names. Who among us do not now know the names Emma Gonzalez or David Hoggs? Their strength, their tears, and their cause became ours. As I headed to New York City, I would stop at Penn Station to make my own sign that day and was soon amidst the throngs of people walking uptown struggling to enter the actual march route. You see, there were hundreds of thousands of people in New York City – so many that the route could not even accommodate the masses. Time Magazine reported more than 800 sibling rallies around the world on that day, and Vox news estimated at least 1.2 million marchers joined over 450 marches across the U.S., as footage of people marching in snow and sun surfaced on Twitter and Facebook. It was one of the largest protests since those to protest the Vietnam War. But nothing was as big as the gathering in Washington, D.C., where as many as 800,000 people would come from places as far away as California to Maine and every state in between to stand on a stage with the Capitol building in the background – clearly giving a signal to our elected officials that there would be no more tolerance with gun violence. Whether in New York, Paris, Melbourne or Washington, we were all on the street to show solidarity with Emma, David, and Anthony Borges – the last student survivor to be released from the hospital five weeks after the shooting – to make them know that we will not forget the sacrifices that they and their friends made in this war. And we would never forget the riveting speeches of kids like 11 year old Naomi Wadler, who reminded us that gun violence has long plagued African American communities as well, and there were many, many children who never got to grow up in those neighborhoods because we, as a society, had not done enough to stop this plague. These students’ cause was now a call for gun control and school safety reform. We, as students, walked out of our buildings days earlier to show that we were all in support, and we heard their cries. We were going to be the agents of change as we felt it was time for the young to lead this battle after decades of zero improvements in laws to address the problem. We were now calling on the federal government to stop being a hindrance to progress and to fund research on gun violence at the National Institutes of Health and at other research organizations because this was now a public health problem. We were kids who discovered our voices in the wake of Parkland students’ screams … until some of them screamed no more. There were 15,549 gun deaths in the United States in 2017, excluding suicides, according to Gun Violence Archive – a nonprofit organization that collects and tracks this data. The same organization lists 4,221 deaths and 7,406 injuries to gun violence in 2018 from 16,695 incidents. An estimated 177 kids under age 11 were killed or injured so far this year from gun violence, and 734 teens between ages 12 and 17 were killed or injured for the same period. A remarkable 64 incidents were due to “mass shootings,” which requires at least 3 injuries in the one incident to be placed in this category. So, do we have a problem with gun violence? Over a million marchers in the wake of the Parkland shooting said yes. And so it was, as millions watched the very brave Emma Gonzalez, who had become one of the strongest voices from that school when she expressed her exhaustion from all of the excuses she had heard from legislators failing to regulate gun ownership, that very brave young woman reminded us of each of the students who lived normal lives but won’t do so again. And then, she stood silent, and the world did with her. At that moment, we were reminded that at the end of the day, the “March for Our Lives” was also a massive moment of mourning for some very young kids who died way too soon for an utterly avoidable reason. It is somewhat curious that this mass murder of kids would have occurred on Valentine’s Day – giving it a natural day for remembrance that could not possibly be more opposite in cultural norm. One of the small ironies I found in the location of this shooting was that the school was named for Marjory Stoneman Douglas – a renowned American journalist and author who was a staunch advocate for women’s suffrage. She was a woman who confidently owned her own voice, and similarly, the students at the school named for her did her proud with the agency they took over this horrific situation. Parkland students taught us all so many lessons for their strength, their emotional honesty, and their resolve to make a difference. 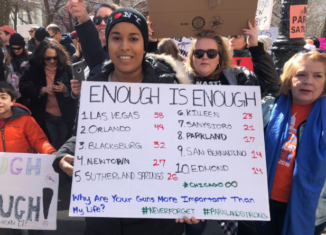 They are also proving that action begins with each of us taking on our civic duty to vote – with mass registration of students now a common event at the Marches. Their strength would provide a platform for students from other notorious school shootings, like Columbine, Sandy Hook, and urban areas, to step forward and make their voices heard in a true testament to Stoneman Douglas. They have proven that no matter how horrific the situation, we do not ever have to admit defeat to evil.